Trading liquidity is an important aspect of trading futures, especially if you are a day trader. Trading is already hard of enough endeavor, imagine not getting your fills and dealing with huge bid/ask spreads. As the old saying goes, there is strength in numbers. It takes far more money to move a highly liquid contract versus a thinly traded over the counter security. This high liquidity provides you the investor somewhat of a safety against sharp price movements and market manipulation. Think of liquidity as a sort of insurance policy in the market. Well in this article, we are going to highlight the 10 most liquid futures contracts around the world. 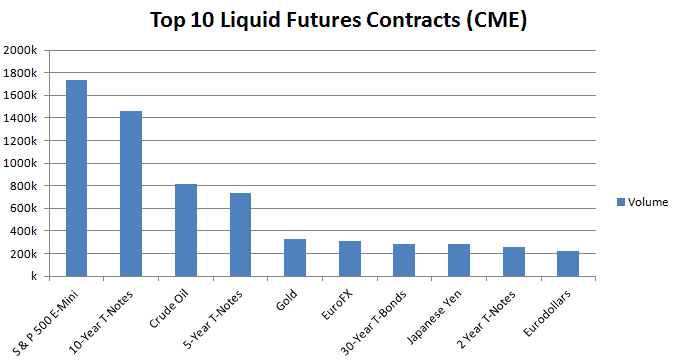 The chart below shows the top 10 liquid futures contracts by volume across different futures exchanges. If you are looking for the most liquid futures contracts specific to the Chicago Mercantile Exchange (CME), here you go. You may be thinking, why highlight the CME? The simple answer - the CME is a juggernaut and I am from the United States, so I need to understand my local markets. To this point, I am going to provide a detailed overview of each highly liquid contract. You can use this list as a starting point to determine which contract best meets your trading goals. The S&P500 Emini futures contract attracts an average trading volume of over 1.6 million contracts on any given day. Without a doubt, the S&P500 E-mini futures contracts stand head and shoulders above the rest. What makes it attractive to trade are the low day trading margins and tight tick size. Not to mention the S&P500 E-mini futures contracts track the underlying S&P500 stock index thus making it easy for speculators to gain exposure to one of the most popular market indexes. Due to the S&P500 pretty much trading around the clock, traders based anywhere around the world are able to trade the contract with ease. The small tick size of a quarter point makes it relatively easy for futures day traders to manage their risks with little capital requirements. Although there is the standard S&P 500 big futures contract, speculators and hedge funds have long flocked to the E-mini futures contract due to the quarter tick. 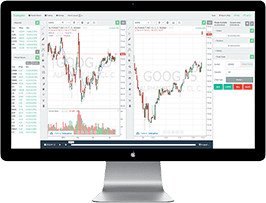 For retail traders looking to get started in futures trading, the E-mini is ideal because the smaller tick size thus requires less upfront initial investment. The S&P500 E-mini contract is also known as one of the most friendly contracts when it comes to technical analysis. You will notice the E-ini contract adheres to key support and resistance levels. This consistent price movement makes sense due to the low volatility of the broad market mixed with high trading volume. Once you put these two things together, it generally leads to predictable price patterns. 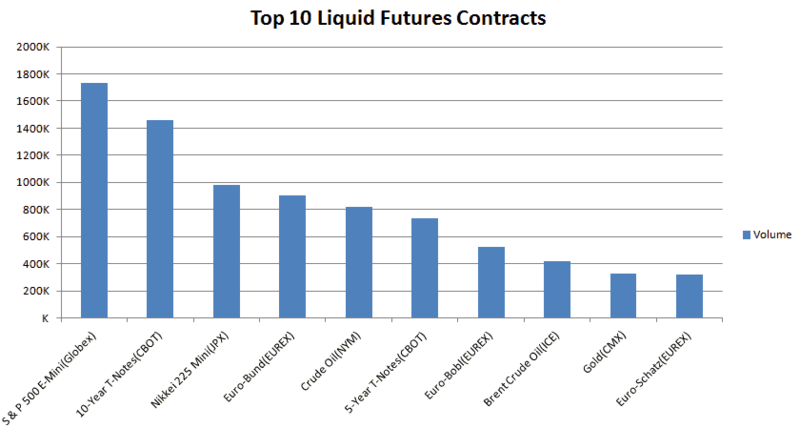 It is not surprising to find that the 10-year Treasury note futures rank as the number two in the list of the top 10 most liquid futures contracts. 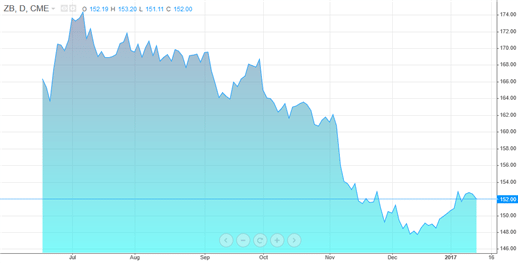 The 10-year Treasury note is in a sweet spot in terms of maturity. It is not too short and therefore resilient to short-term interest rates and at the same the maturity is not too far out, thus allowing the Note to resist market forces impacting the 30-year. The 10-year T-Note futures track the underlying cash market of the 10-year Treasury note issued by the U.S. Department of Treasury. Futures traders who invest in the 10-year T-Note have the option to speculate on interest rates and are able to go long and short with relative ease. The big difference between the underlying cash market and the futures market is the contract can be settled for cash, so there is no physical delivery of the 10-year T-note. While speculators find it attractive to trade interest rates, traders who have actual exposure to the underlying market can also hedge their risks by trading the futures derivatives contracts of the 10-year T-Note futures. The 10-year T-Note futures also come with reasonably low margin requirements for swing traders and the margin requirements for day traders are also very competitive. Crude oil futures come in as the third most liquid futures contract and ranks as the first among the commodity futures contracts. Crude oil futures are traded at the New York Mercantile Exchange (NYMEX) part of the CME group and the futures contract tracks the underlying market of the light sweet crude oil with the ticker CL. Note the ICE futures exchange also offers crude oil futures but are different than CL oil futures contract. Having an average daily trading volume of close to 800k, crude oil futures make for an exciting market. Known for its volatility and knee-jerk reactions to news events make crude oil futures an attractive target for traders. The crude oil futures contracts trade on a monthly basis and roll over into the next month. Market participants with exposure to the bond markets will find the 5-year T-Note futures an attractive alternative to the 10-year T-Note futures. The Federal Reserve's monetary policies have a big influence on the 5-year T-Note futures like most short-term interest rate or Treasury instruments. The 5-year T-Note futures are offered by the Chicago Board of Options Trade (CBOT) and are standardized. The face value of the 5-year T-Note futures is $100,000, has four quarterly contract months and trades close to 24/7. Gold futures contracts are the fifth most liquid futures contract and rank second among commodity futures. The contract tracks the underlying spot gold markets and the futures prices are mark to market on a daily basis. Gold futures have an average daily volume of over 300k and are offered by COMEX, part of the CME group. Although gold futures contracts are expensive to trade, they are a popular hedging choice against global currencies and poor market conditions. Most of the gold futures contracts are made up of speculators who by and large do not have any interest in taking delivery of the physical metal. There are many different versions of gold futures contracts including micro or mini contracts; however, the standard gold futures contract is the most popular. The day trading margins for gold are a bit expensive, but that doesn’t deter day traders from trading the standard gold futures contracts. Even with a tick size of $10.00, gold futures are still extremely liquid. The CME group offers EuroFX futures or simply Euro futures are part of the currency futures class of contracts. The Euro FX futures rank at number 6 overall and first among currency futures. The Euro Fx futures contracts or Euro/US dollar futures contracts offers traders an attractive futures contract to gain exposure to the 27-nation single currency. The contracts in the Euro/US dollar are extremely liquid and come in notional values of €125,000. There are also other versions of the Euro Fx futures contracts including the E-mini and the E-micro. Still, among the three, the standard euro fx futures contract is the most popular. The Euro Fx futures also come with low day trading margin requirements and for futures traders who prefer to swing trade the contracts; the standard margin requirements are fairly competitive. The Euro/US dollar futures contracts come in four quarterly cycles and trades almost 24 hours a day. The Euro Fx futures track the prices of the underlying spot EURUSD prices with the contracts being marked-to-market on a daily basis. The 30-year Treasury bond futures, also known as the T-Bond futures represent the 30-year maturity on interest rates. The 30-year interest rates are a critical factor for determining key rates such as mortgages. 30-year T-Bond futures were originally launched in 1977 and are one of the widely traded bond futures contracts across speculators, hedge funds and other market participants. Japanese yen futures are the second most liquid currency futures contracts and rank number eight overall. The Japanese yen futures contracts give futures traders the exposure to the third largest economy in the world. The yen futures contracts are the inverse of the spot market prices of USD/JPY. The yen futures contracts control a contract size of ¥12,500,000 with a tick value of $6.25 and have a minimum tick of 0.0000005. The Japanese yen is known for its unique characteristic as a safe haven currency. It is not just currency speculators who flock to the yen futures contracts but also traders and investors who have exposure to the equity markets. Lastly, the yen currency tends to appreciate during times of increased uncertainty in the markets. 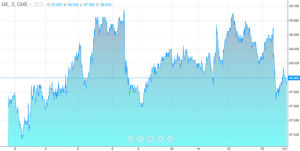 The 2-year Treasury Note futures track the underlying markets of the 2-year T-note bonds. The futures derivatives are offered on the CBOT exchange and a product of the CME group. The 2-year Treasury note is third among the three interest rate futures derivatives. The 2-year T-Note futures have quarterly contract months of March, June, September, and December and control a contract size of $200,000 with a minimum tick of 0.0078125 with the dollar value of each tick priced at $15.625. Eurodollars are part of the interest-bearing bank deposits that are denominated in U.S. dollars but held at banks outside the United States. Some investors confuse Eurodollars with Euro fx futures contracts. The Eurodollars are attractive for investors due to the fact that they do not fall under the jurisdiction of the Federal Reserve and also come with lower regulations. As a result, the high level of risk makes it attractive for investors, especially those who seek higher yields. Eurodollar futures are available 10 contract months with a minimum tick size of 0.0025 with a tick value of $6.25. You have a lot of options when it comes to trading futures contracts. Below are a few questions you can ask yourself, which can help with your decision of where to invest. How much money do you have to invest? Some of the contracts require a larger upfront investment, while others have a low barrier to entry. What is your local market? This is not a hard fast requirement, but it's pretty hard to trade Yen futures if you are asleep. Do you need to hedge against market volatility? Futures are a great way to hedge against a larger cash position. Assess which futures contract will best protect your portfolio.